FMI offers different accessories that allow the customers to use our optical oxygen sensors in different measurement set-ups. See our accessories products below and let us know if you can't find the accessory you need for your application. 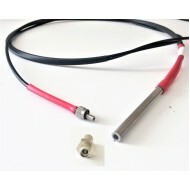 --- Please Select --- 1/8"	5/32"	1/4 "
Reflection probe is a fiber optic bundle (glass) that can be used for transmitting excitation light ..
--- Please Select --- 1/8"	5/32"	1/4 "	12/32"
Thermistor Probe, 7" long, Stainless Steel Sheath with 40 Inches (1 meter) of Lead Wire and a Resist..